When the fine folks at Dark Horse gave me the chance to preview Cole Haddon’s The Strange Case of Mr. Hyde, I’ll admit I was skeptical. A Victorian foray into the strange and bizarre, combining Jack the Ripper, Mr. Hyde, and a character from H.G. Wells’ Invisible Man? Sounds insane. Here’s the thing: It is. In the good way. We got a chance to talk to the brilliant creator behind the graphic novel (and upcoming film) himself, Cole Haddon. GCC: The Strange Case of Mr. Hyde was your first foray into comics, and was based on a film concept. I read that you worked back and forth on the comic and film scripts. What was that process like? Cole Haddon: It was, I’d say, the best experience I’ve ever had as a creator. And probably one I’ll never have again. I say that because the lengthy development/writing period isn’t one that either the film or comic business normally allows. It started with a pitch to producers Mark Gordon Company and, of course, Dark Horse Entertainment. Dark Horse agreed it was a great premise for a film and agreed to produce both it and the comic book mini-series that it would be based upon. I then set out, with Keith Goldberg at Dark Horse, to develop the outline for the film. Keith is a story genius, for my money. He beat the hell out of me, but got, I think, some of the best work I’ve ever done out of me as well. After the outline, we pitched the film around town to buyers. Skydance Entertainment bought it, and that’s when the real work started. I first wrote the comic books based on the film outline, then I went back and wrote the screenplay based on both the outline but also, more extensively, the comic book. Things had evolved, story-wise, during the writing of the series, I guess you’d say. After the screenplay, though, the story had evolved even further, had gotten even better I thought, and so I then went back and rewrote the comic book. After that, believe it or not, I went back and rewrote the screenplay. All of that work resulted in The Strange Case of Mr. Hyde, or, as the film adaptation will be called, just Hyde. It might sound exhausting, but I’m extremely proud of the results. GCC: What stories (other than the source material, obviously) was your inspiration for the story? Haddon: I knew I wanted Strange Case to be a franchise, and so I had to create a protagonist that would drive the storyline forward. For that, I picked Colonel Thomas Adye from H.G. Wells’s The Invisible Man. He’s a minor character there, but I thought I could do something with him. Expand upon him, that is. Give him some scope that wasn’t there before. So, in that regard, The Strange Case of Mr. Hyde is Adye’s secret origin. Dr. Moreau, of Wells’s The Island of Dr. Moreau, also makes an appearance early in the series as a peer of Dr. Jekyll’s. Besides these, I drew heavily from years of other people’s research into the Jack the Ripper’s murders and also found inspiration, tonally and stylistically, in Universal’s monster movies and Hammer’s gothic horrors. Especially Hammer’s films, like The Curse of Frankenstein and The Horror of Dracula. Colorist Jim Campbell worked hard to recreate the color palette of those worlds. GCC: The Strange Case of Mr. Hyde is both a continuation of the original Jekyll/Hyde novel by Robert Louis Stevenson and a springboard for Inspector Adye, placing both in the real-life event of the Jack the Ripper killings. Was it hard combining these elements? Haddon: Not at all, actually. Jack the Ripper has been mythologized for years now, to the point that he’s more or less treated by pop culture as a gothic monster anyway. It was challenging, I guess at times, to hold true to the events of the cases; I was unwilling to fudge historical facts like who died and how; but, mostly, it was just a matter of connecting the dots. GCC: The art in Hyde is really great. How did you and artist M.S. Corley meet? Haddon: My editor at Dark Horse, Dave Land, had suggested numerous, more-established artists. Artists I would be glad to work with any other day of the week. But in this case, I knew I wanted Strange Case to look and feel different from other comic books. I wanted it, like the Universal and Hammer horrors, to have a style and language all its own. Dave then suggested I look at Mike Corley’s work. Mike put together a few pieces of concept art and I was immediately taken by his ability to convey complex emotions in the characters. Even his first attempts at characters expressed personality. One phone conversation revealed we had a mutual passion for gothic horror, which is all I needed to hear to seal the deal. I haven’t regretted the decision to go with him once. GCC: The comic ends with a tease of future adventures for Adye. Are plans in the works for a second adventure? Can we expect Hyde to return as well? Haddon: We’re discussing Inspector Adye’s next “strange case” now, in fact. I think it’s pretty clear from the last page what monstrous villain would be at the center of it. As for Hyde…you’ll just have to wait and see. GCC: Finally, a must-ask geek question: if you could take a super-serum of your own, what power would you like? Haddon: I wish my answer were sexier, but my super-serum of choice would be one that boosted by I.Q. by 40 or 50 points. I’d like to specifically have near-perfect recollection of that which I read and watch. If someone put that drug on the market, I’d be the first one to ask for a prescription. GCC: You and me both! Thanks, as always, to Cole Haddon, Aub Driver, and all of the really supportive people at Dark Horse Comics! Mr. Haddon can be found on Twitter (@colehaddon). I can tell you from personal experience that he’s a really nice guy! 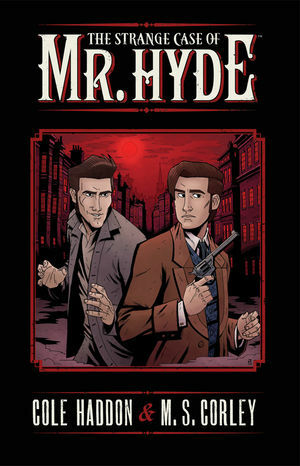 Be sure to check out The Strange Case of Mr. Hyde, out in stores February 22nd! Also, let us know in the comments below if you’d like a Geek Crash Course before the movie is out in theaters! This entry was posted in Interview and tagged cole haddon, comic, dark horse comics, hyde, movie, strange case of mr. hyde, US. Bookmark the permalink.